For the last couple of years, netbooks have offered a super-low-priced alternative to full-featured notebooks, in an incredibly portable package. For students looking to save money or for those who wanted a second computer that was easy to travel with, netbooks were the perfect solution. However, prices for full-featured notebooks have come down considerably. Today you can get a Dell Inspiron 15 for $449 (at dell.com), an HP G60t series for $499 (at hp.com) and a Lenovo G550 for $499 (at lenovo.com). With the price advantage largely gone, when does it make sense to buy a netbook, with a much more limited set of features, instead of a full-featured notebook? To determine whether the netbook still had a place, I gave the Toshiba Mini NB205 (list $400) netbook a test drive to see how it worked out in my day-to-day computing tasks. 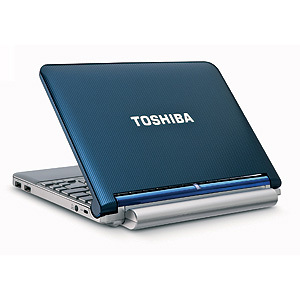 The Mini NB205 is a pretty, blue, 10-inch netbook (it comes in brown, white and pink as well). Weighing in at 2.8 lb (3.4 lb with its AC adapter), it measures 10.4 x 7.6 x 1.3 inches and looks like the baby brother of my regular 16-inch notebook, a Dell Studio XPS 16. And, at $400, it still runs at least $50 less than the cheapest notebooks. The Mini NB205 was much smaller and lighter than most entry-level notebooks, which have a 15-inch display and a weight between 5-6 pounds. This was great for when I needed to throw the netbook into my bag to get some work done at my local Starbucks. It was not as great for actually doing the work. The Mini NB205’s keyboard is quite spacious for the computer’s overall size. Even so, I kept turning on the CAPS LOCK whenever I wanted to type an “A” or an “S.” I’m pretty sure, I could get used to it. But I didn’t in the time I had it. On the other hand, the touchpad was large, smooth and easy to use with comfy, dedicated right and left mouse buttons. You also give up a significant amount of processor speed and memory with netbooks, meaning tasks such as photo editing or gaming will be tedious or impossible. I use Adobe Photoshop Elements in my work, and it simply wasn’t going to happen on the Mini NB205. Web browsing, email and word processing were all no problem, though, and that is where most of us spend almost all of our time. What netbooks give up in power, they gain in power consumption. I got six hours of video playback for my kids on a recent trip, which is far more than I’ve managed from my full-sized notebooks. Plus the Mini NB205 comes with USB sleep-and-charge ports, which charge any of your USB gadgets even when the netbook’s power is turned off. So I always had an iPod, Blackberry or camera hanging off its little frame. What can I say, there are never enough plugs in our apartment! In the end, a netbook is a good option if a few key things fall into place. Ultra-portability has to be very important to you. You should only plan on doing word processing, emailing and browsing the Web. And, you have to be able to live without a CD/DVD drive for loading software. No, I wouldn’t suggest swapping it out for your notebook, but really, for $400, it does make a perfect extra hand around the house or on the run. I found that a netbook is sufficient for most tasks - the lack of a CD/DVD drive for installing software is generally solved by most companies who allow you to download the software. If you do want to edit audio, pictures, or other tasks involving a lot of processor speed, then you won’t want a netbook. However, for word-processing and other Office tasks, e-mailing, facebook, etc., and other internet related tasks, the netbook works great for me - at a much lower cost. I personally prefer the full-featured laptop since I always use it both in work and at home. But your article is very helpful if ever I would consider buying an alternative.